White Book Agency’s PR & Marketing Director, Nancy Vaughn, was contacted by a friend, who was contacted by another friend, who is making a difference and helping a friend. So now White Book is helping to spread the word about Julie and we hope that you will help us spread the word, too! See you on August 6th! We know the economy is tough, but what if meeting your bills meant a matter of life or death? Julie Templin’s doctor said she would never survive Leukemia. That was 25 years ago! But as a consequence of radiation, this independent 43-year old has had a lung and kidney transplant, the latter of which was donated by the same woman, now friend, who originally donated her bone marrow. Julie is now in need of a second lung transplant, which means more medical bills she can’t meet! That’s when Julie’s friend and her two sisters stepped in. “It broke our hearts when Julie said her daily breathing compares to breathing through a tiny coffee stirrer. We just needed to do something,” said Tana Mayo Little. Julie, a former Marketing Producer at WFLA-TV Channel 8, is on oxygen around the clock. Through her tenacity, she got herself on a lung transplant list at Temple University Hospital in Philadelphia. Instead of asking for assistance, this dedicated woman worked two jobs, sometimes seven days a week. These days she is unable to go from her kitchen to her living room without struggling for breath. But she courageously fights on! 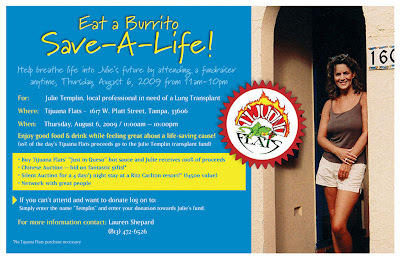 At last, South Tampa’s Tijuana Flats has agreed to help breathe new life into Julie’s future with a fundraiser to be held on Thursday, Aug. 6, 2009, from 11 a.m. – 10 p.m. The restaurant, located at 1617 West Platt St., has long supported local charities with their “Just In Queso Foundation.” The owner has agreed to donate 10% of the day’s restaurant proceeds to Julie’s National Transplant Fund and 100% of the proceeds from bottle sales of their “Just In Queso” hot sauce. Local vendors have offered Chinese Auction items along with a 4 day/3 night stay at a Ritz Carlton resort! (No Tijuana Flats purchase necessary). For full fundraiser invite information, please click here.